Morning. First full weekend of college football. What a game to kick off opening weekend with Alabama/FSU. Some other good matchups as well. Had some rain after 11pm'ish last night that dumped .24". Jax indicated for today's forecast they basically have no clue what's going to happen, lol. Huh?? The model ebbs and flows continue. If a storm were to threaten, I would be wishful of a dry period beforehand. Don't want/need saturated soils before a named system approaches. agreement among models is worth noting and taking serious. front is more likely, but we will just need to monitor. a tropical cyclone threatens your area. I liked Mroczka's Irma discussion. As to the trough discussion, I hope it digs deep, lol. But, yeah, hard to get a strong front here in early September. Current visible sat and 5 day forecast cone. StAugustineFL wrote: Current visible sat and 5 day forecast cone. NHC discussion has her dipping from 19N to 17N before latitude gain resumes. Good morning all. Mark Sudduth put out a UTube video last night explaining the atmospheric elements that will affect Irma's track. Search UTube HurricaneTracks - one word. He's not my favorite but Mark clearly illustrates the complex dynamics involved in predicting folks who might be impacted by this storm. Take a look. Feedback welcome. Ok where's the coffee pot?! StAugustineFL wrote: Morning. First full weekend of college football. What a game to kick off opening weekend with Alabama/FSU. Some other good matchups as well. 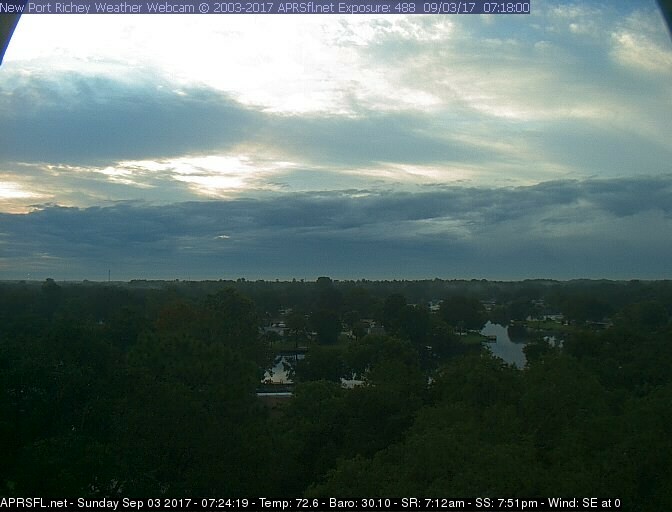 too bad this trough/front didn't come over florida this time next weekend..could have been a saving grace maybe..pushing Irma away? PuppyToes wrote: Good morning all. Mark Sudduth put out a UTube video last night explaining the atmospheric elements that will affect Irma's track. Search UTube HurricaneTracks - one word. He's not my favorite but Mark clearly illustrates the complex dynamics involved in predicting folks who might be impacted by this storm. Take a look. Feedback welcome. Ok where's the coffee pot?! Thanks PuppyToes! I don't believe I've ever watched one of his vids, but I did watch the one you referenced from last night. There is not a whole lot to talk about right now. Until the trough activity is a clear forecast, it's a toss up as to what happens. Seriously - it's all staying off shore. ok San, that's a good move alright with all this wet weather lately. and..does 922 mb make Irma a cat-4?..IF it indeed takes this path..look at the size of this monster,even if it doesn't exactly come ashore..all of us will be getting a pice of this storm...but..i say again..nothing can be believed yet..kinda scary huh. gome...Jenny and yeah I guess all of us on gulf coast..16 days out too far out to believe but..
sure would be great if the Euro model went out in time to 384 hours like the GFS..but it doesn't. San Light rain starting here by me..guess your getting it also by now,line seems to be sinking south..
the storm after Jenny IF it forms would be Jose..60% chance NHC says to form. yeah a lot of thunder out in the gulf..guess it will be over me too next few hours..
at 10 to 15 mph over the tropical Atlantic. St Pete..get any outside chores done..looks like we will get a lot of rain soon,whew almost non stop booming out in the gulf here..
Kenneth City, South Pasadena and Madeira Beach. Levi Cowan just put out an update on Irma. 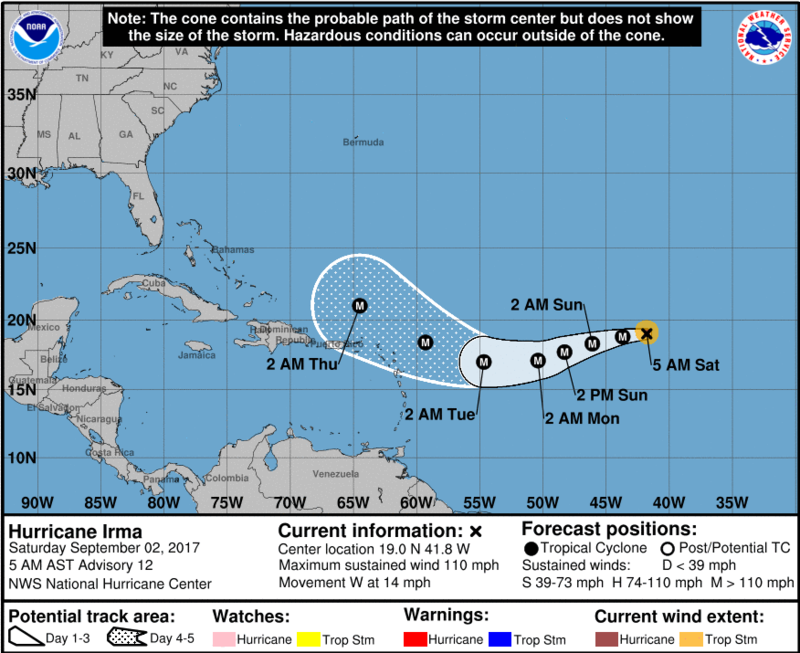 PuppyToes wrote: Levi Cowan just put out an update on Irma. well that's it for me ..good night folks..stay safe out there. I know this is the "hang out" spot for the site but feel free to take a peek around other blogs/pages. Gomey's put out several astromony blogs, there's a Nascar blog (yeah, sorta redneck, lol), and san posted a new blog specific to Irma. It's just our little group here so those blogs aren't from some unknown person. Or, if interested, create your own if there's something you're passionate about. Could be another common interest beyond weather that folks share. On the weather front, mixed sun and clouds today with a brief sprinkle a couple hours ago. So light the pavement showed no signs of being wet. Could barely feel it on the skin or see a few drops on the pond. walking the dogs this early morning,glad it wasn't raining on us lol..
Folks..these were just One run of the models and Nothing can be believed ok...by this coming tues/wens we get into the 5 day range and the NHC will be giving the Real info on Irma ok...no model can be believed yet..Hurricane hunters are supposedly flying into Irma today and they will give the models Correct info..im sure run to run the models will change once again............stay alert prepared and we'll see how this plays out..........just watch....next week the storm goes into maine lol....too early to know ok.
Good Sunday Morning folks! !..I must have gotten some rain overnight,street etc wet...it looks like today a 50/50 chance for a shower or two later........well Blogs Coffee is perking for when you get here..enjpy and relax..its our Holiday weekend !! be ready to move to higher ground should flooding be observed. Morning. Very comfortable start to the day. 70 degrees with a 69 dew point. Been awhile since I've had a DP in the 60's. I'm sure it'll creep back up as the day wears on. The local Fox news station just had a segment on gas prices. The average Tampa Bay area price is $2.62/gallon - up $0.30/gallon in 7 days and the highest price for the year. They indicated prices will go up another $0.05 - $0.10/gallon before leveling off when the refineries get back to standard level production toward the end of the month. Holy crap!! This is a Facebook vid. Not sure how to convert it so all can see. StAugustineFL wrote: Holy crap!! This is a Facebook vid. Not sure how to convert it so all can see. well just after 10am and overcast and for august cool 70's!!!! I don't mind this at all! !..rain so far is staying off the coast,just a sprinkle every now and then..not a bad morning here.